I posted this on my Instagram this past weekend. 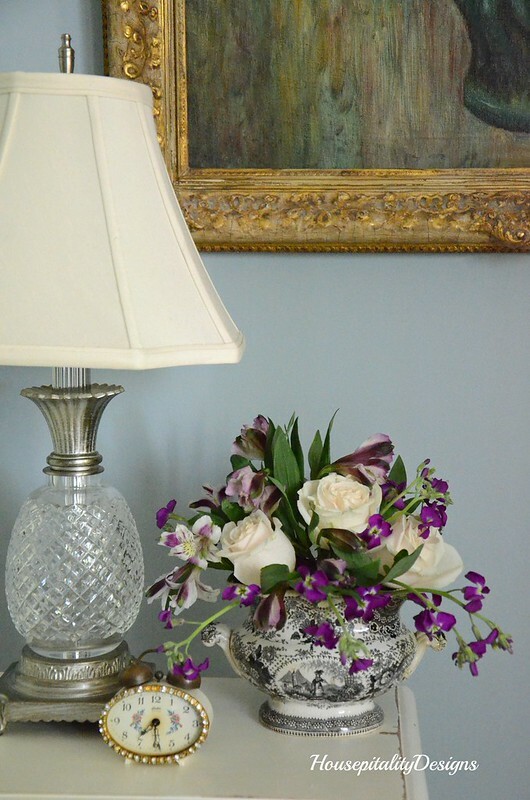 but separate the roses and use them in the various arrangements throughout the house. however, in different containers to coordinate with each room. This is one that I made for the guest room. The guest room has black and white accents . . . accenting the blue and white. in my black and white transferware sugar bowl. 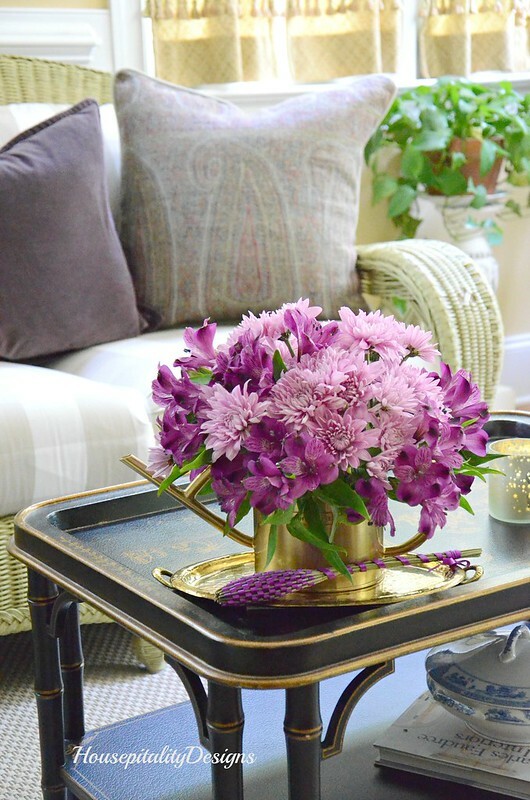 for a simple arrangement and a pop of color in the room. on the kitchen island and one in the sunroom adjacent to the kitchen. and placed them in the ironstone creamers. however, it looks very similar to the one I had made a couple of weeks ago. 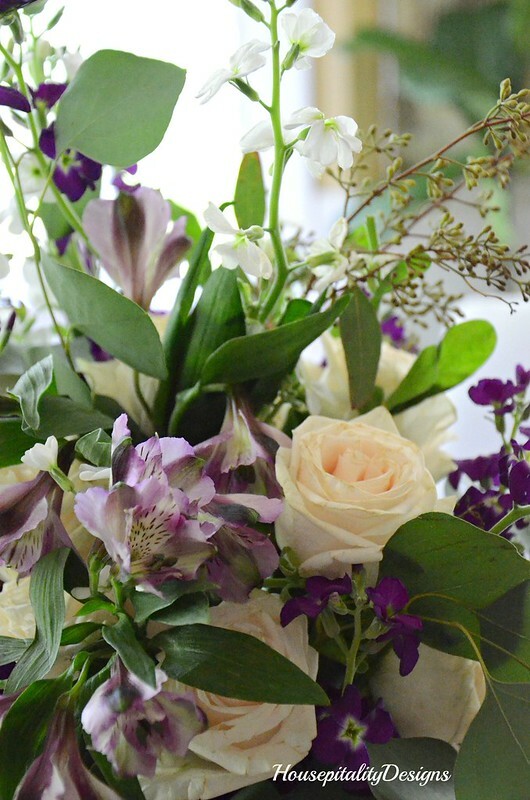 with Stock flowers…..they smell wonderful and are very inexpensive. for as long as the house is on the market, because sweet Loi (Tone on Tone) told me so! that is happening this week. The schedule of great Fall inspiration is below. I am on for Friday …. for Fall porches. Here is a sneakie peekie for this year’s front porch. I will have photos for you soon! In the meantime, check out the Fall inspiration for today of tablescapes. and be sure to check out Monday’s lineup of fabulous Fall mantels. The temps have been a bit cooler here. I am looking forward to the crispness of Fall in the air. 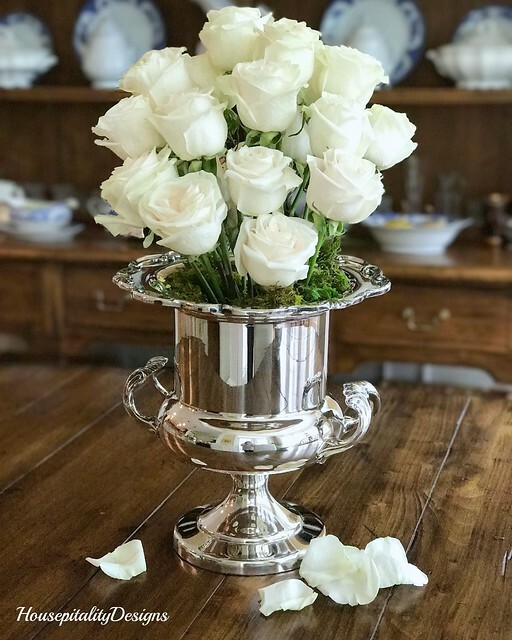 I love how you took your TJ’s roses and made mini bouquets Shirley…more bang for the buck at an already wonderful price! The closest TJ’s is an hour drive, I would love one closer to me. 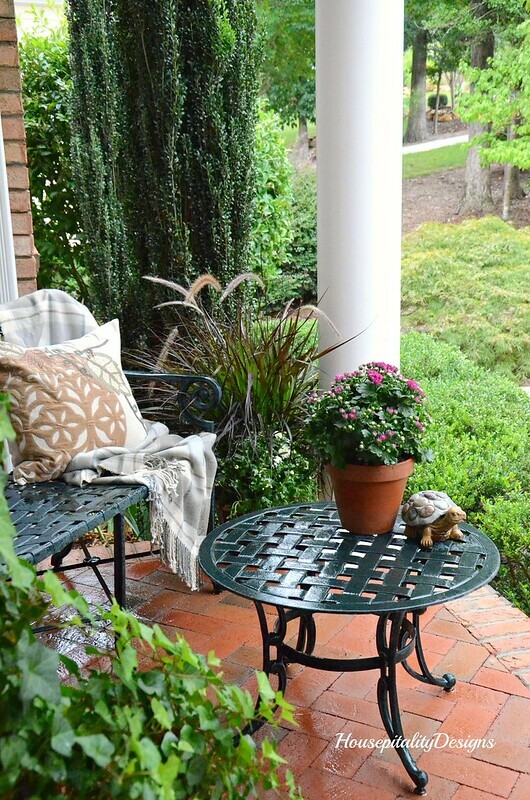 Looking forward to seeing your porch in its fall glory! 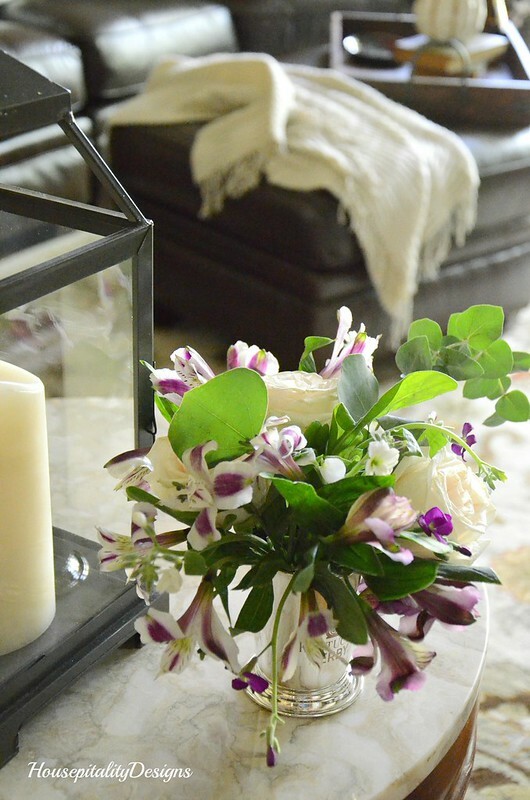 Beautiful arrangements and I know y’all have worked so hard to prepare your home to sell. I’m sure it will photograph beautifully and sell quickly. That house will be on the market for 5 minutes…maybe!!!!!!! The fresh flowers are a great touch throughout. Stock is one of my favorites for adding fragrance. I love how you broke up the roses to shine all around in different arrangements. So pretty! Have a lovely week, my dear! The addition of the flowers to rooms are perfect! Your house is beautiful, I’m sure it’s going to sell very quickly and you’ll be on to the next chapter! I love how you added the flowers around the house…yes when Loi speaks, we listen! I love all your arrangements and pretty containers. Your home is so beautiful I know it will sell fast. Have a great week! Shirley, all of your floral arrangements are beautiful! You are so talented! Your home is beautiful, and I know it will sell fast. Happy Tuesday, sweet friend!!! Your arrangements are all beautiful!!!! I LOVE stock, it is a staple at florists and yes, it smells SO good! Your home will be beautiful in the photos and I am sure will sell quickly!!! ANYONE will be lucky to get it! Wish I could have been part of the Wed. wreaths:) Sounds like fun! Shirley, flowers make me happy and you have made every arrangement unique and beautiful! I can’t wait to see your porch and the realtor photos! Happy Tuesday! 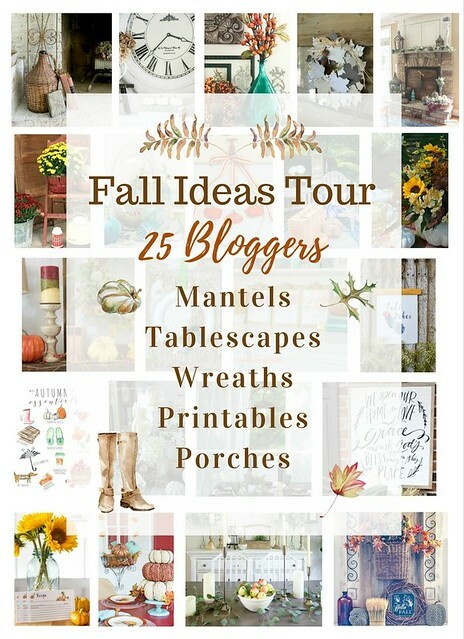 Pam Richardson’s recent post…Tablescape Tuesday: Hurry Up Autumn! All the flower arrangements look fabulous! I don’t think you’ll have to wait long for house to sell !! Awwwww, thank you 🙂 You are the BEST Shirley. Love you lots!! 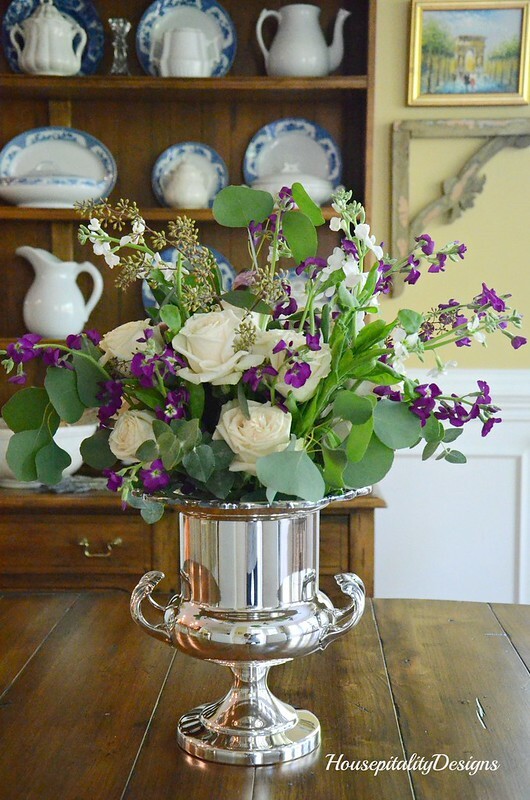 Beautiful flowers in beautiful vessels, you have style girl! 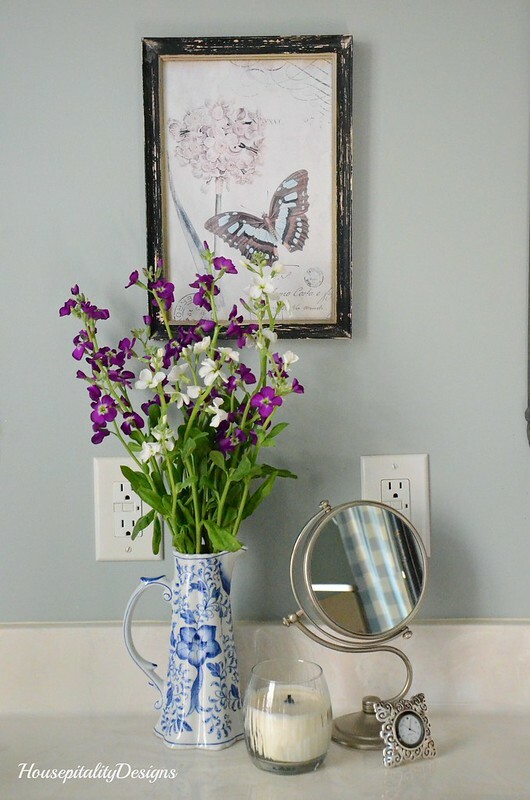 Oh, my, those floral accents are exquisite and the perfect addition to every room. Your home is truly a showplace and your extraordinary talent shines through. I hope your bags are packed, because your home is sure to sell very quickly!! LOL!! What gorgeous arrangements! And love the containers. Your florals are just gorgeous Shirley! I’ve got to try an arrangement in my champagne bucket, so stunning! Your fresh flower arrangements are beautiful. I know you house will sell quickly. You flower arrangements are so beautiful Shirley! I love Trader Joe’s flowers and those white Roses were a find at Target! Oh my gosh, Shirley, those arrangements are FABULOUS! Each and every one, the vessels, the combinations. I bet your home sells very quickly. I hope you’re ready! Your arrangements are all gorgeous, Shirley. I love how they are all different and I know it was so much fun arranging them. Your house is beautiful and I don’t think you’ll have to wait long. They may want to buy all your furniture, too. All your arrangements are lovely. 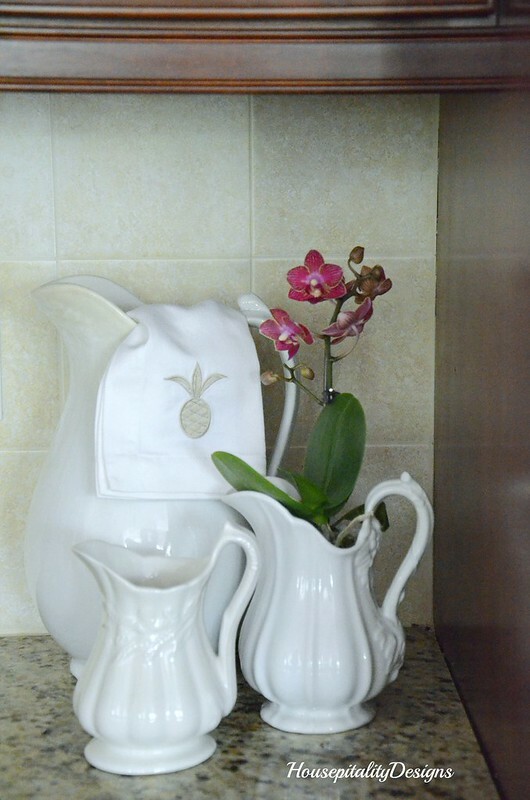 However, I am partial to the sweet orchid in the ironstone pitcher. I hope you are ready to move, because your house will be gone in a blink. It is beautiful ! Your floral arrangements are so beautiful, Shirley, and add even more to your already gorgeous house! Oh Shirley get ready to move. This beautiful home of yours is going to sell quickly. I have had the pleasure to be in your pretty home and it is so open, bright, warm and welcoming and anyone coming in is going to feel that immediately. Good Luck as you and Tom begin this new part of life. Kris @ Junk Chic Cottage’s recent post…Well Hello! Shirley, your flowers are beautiful! I just have no doubt that your house will sell easily. Stacey’s recent post…Progress in Our Dining Room but What Would You Do? Flower decoration is perfect way to attract people. You house looking so beautiful and lovely.